The Time Living Brennington bed frame is manufactured in metal then a shiny silver finish is added to complete the contemporary look. The features on the Brennington are a sleek curved headboard and low foot end, a sprung slatted base is used for added comfort and support. 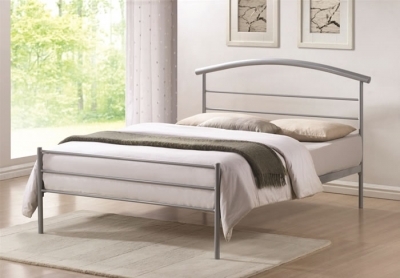 This stylish piece of bedroom furniture is available in single and a double sizes and requires a UK standard mattress.